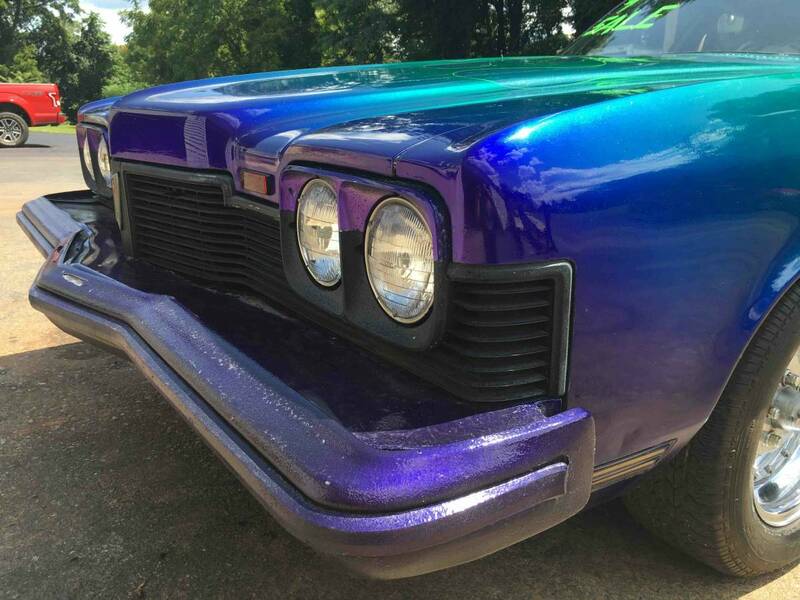 Today's Pontiac seriously lost the plot and went from vintage classic to the deep end of custom junk category. The car has a number of modifications that on their own are interesting, but when you combine them all together one car it is like emptying half a bottle of Tabasco on your taco. The most nonsensical feature is the elimination of the sedans back seat for a speaker box that effectively makes this giant boat a two seater. If the custom flame paint job wasn't over the top enough for you, this Catalina actually has a console mounted switch to throw out real flames out the exhaust (seller can provide video documentation)! 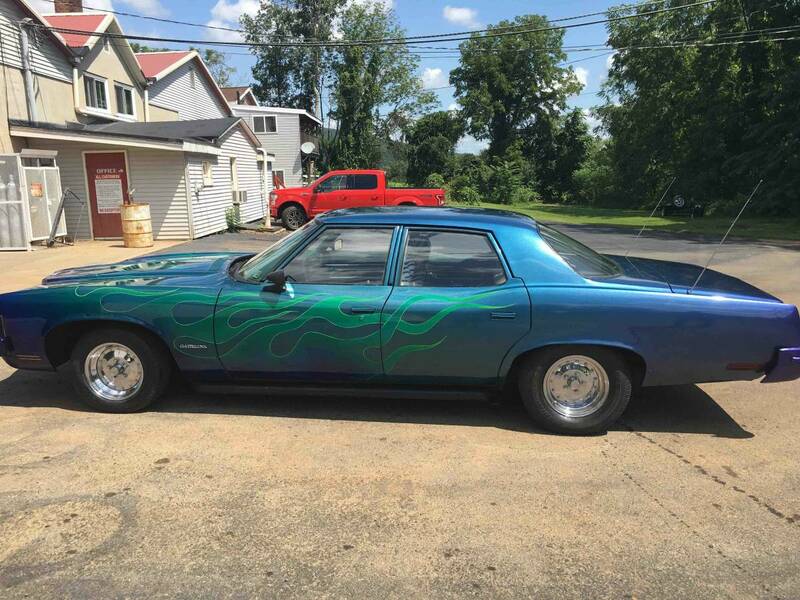 Find this 1973 Pontiac Catalina for sale in Hamburg, PA for $2,900 via craigslist. The car has 99,000 original miles and is equipped with AC. The R12 AC did work, but the compressor belt was cut for some unknown reason. The custom oak center console houses some extra gauges, switches for flame throwers, and what looks to be a 1990's Grand Am automatic shifter. 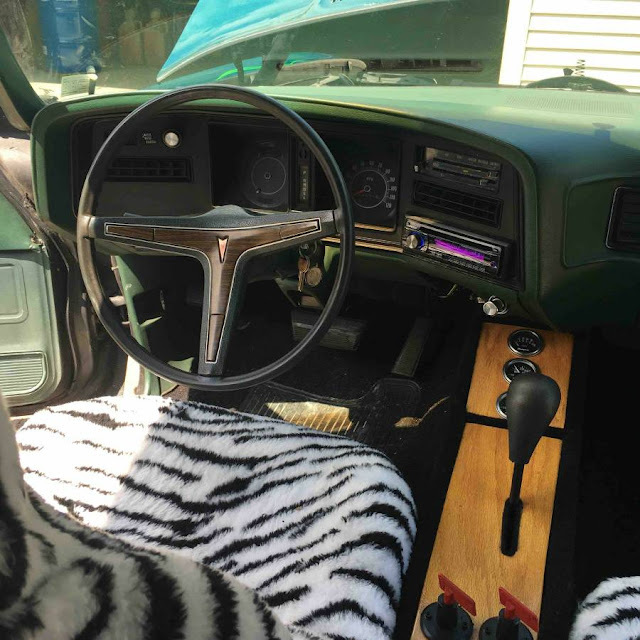 The interior is a horrible shade of 1970's green, but the black and white tiger print seat covers liven things up. The Pontiac 350 engine would have only had 150 hp stock this year and came with a two barrel. A Holley four barrel carb has been fitted here along with the tried and true turbo 400 auto trans. 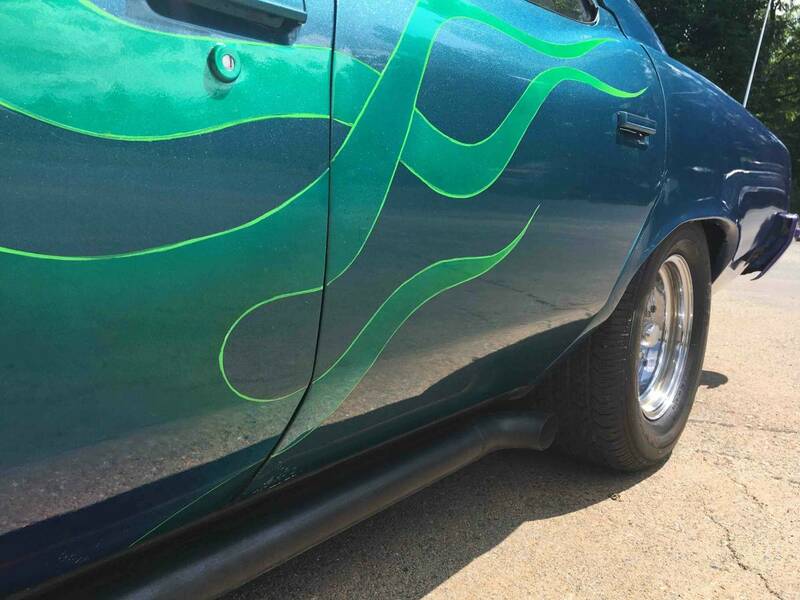 The custom flame paint job is said to be over a good body with all major floor work done. There is some paint flaking on the bumpers and some intentionally unfixed rust spots on the left fender. The custom side pipe exhaust must provide some rumble and not something you see on many sedans. There are plenty of pictures in the ad and ample description as to what has been done, but there is no mention of why or how or who this Poncho is deserving of the Mythical Beast tag on the trunk lid. The pictures do not show a direct shot of the tag so you have to look for it in the pictures. The car is equipped with dual power antennas. 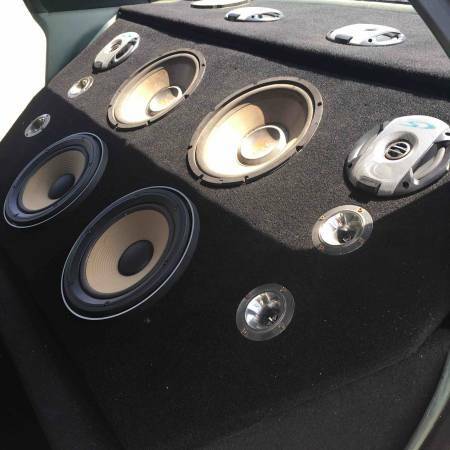 There are amps in the trunk and this wall of speakers taking up what used to be the back seat. One of the more believable claims in the ad is that this set up is LOUD. Cory is working on replacing the clogged cats in his 1995 Mercedes C36 AMG. Seller, if you're reading this, post the flame video! This would be worth it just to pick the kids up from school. And shoot some flames. Never heard of intentional rust before. Lots of that in the Pacific Northwest. Nice find Cory. The best part of the VW van critter is that a lot of the "rusty" parts are made from plastic. You could one pick up one child from school as there is no back seat! Ok, this is an odd small world admission. That's a '73 Pontiac in Hamburg, PA...if it's been a local car since new, it was sold new at my uncle's Buick/Pontiac dealership in Hamburg. This post is not as satisfying for me as it could have been, if the car was desireable in any way, shape or form.